Wrist fractures usually occur following a fall onto an outstretched hand. Patients with fragile bones due to osteoporosis are at a particularly high risk. Wrist fractures also occur following high energy impact such as in sports injuries and motor vehicle accidents. The main symptoms of a wrist fracture are pain and swelling with a notable deformity in the wrist’s appearance. Some patients more rarely experience numbness in the region of an affected nerve and loss of normal hand movements. Usually patients first attend accident and emergency where the emergency doctor takes a history and performs an examination of the wrist. X-rays of the wrist are performed to identify a fracture. Sometimes x-rays do not detect the fracture when it is early and patients are treated cautiously with a splint and repeat x-ray at 10-14 days after the initial injury. A CT or MRI scan can sometimes be performed to detect fractures at an earlier stage than x-rays. 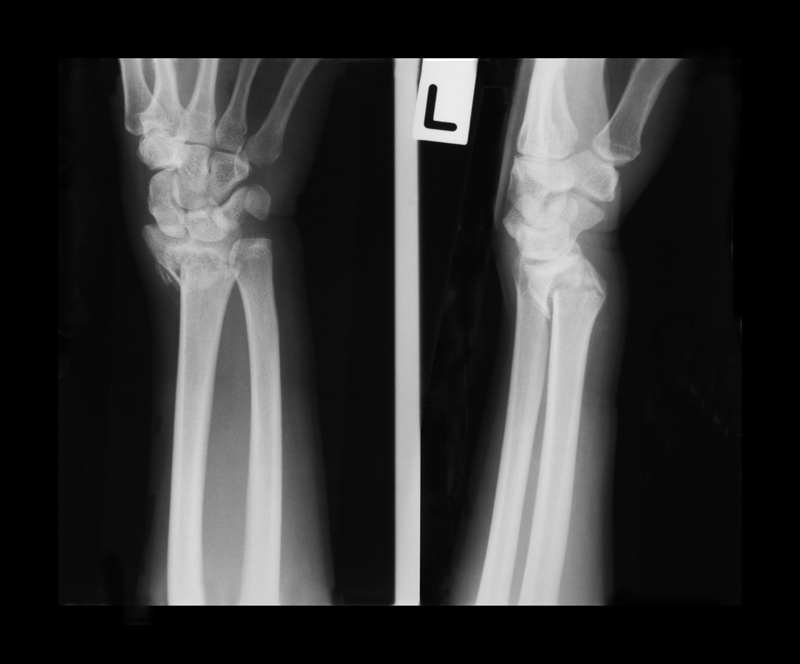 Non-displaced fractures can be treated by application of a plaster cast over the wrist. Patients will attend clinic on a regular basis and x-rays taken to monitor the healing process. The bones take 6 weeks to heal and at this point the cast removed. The hand therapist will then provide exercises to restore normal wrist movement and function. Displaced fractures may require manipulation, which means the re-alignment of the bones by reduction (pulling and pushing the bones into a normal position). Sometimes it is not possible to achieve a satisfactory reduction and surgery is needed to obtain a more stable configuration and reduce the risk of complications such as long-term arthritis or nerve or tendon damage. Comminuted fractures (multiple fragments) usually require surgery to bring the fragments into a more stable configuration. Open fractures require urgent care to prevent bone infections. This involves a thorough antiseptic cleaning of the wound in surgical theatre and a surgical method of fracture fixation described below. Surgical treatment aims to restore the normal alignment of the wrist bones. This may be achieved with metallic wires, screws, plates or external frames. In some patients a bone graft is needed to stimulate the healing process particularly where the bone is broken into multiple fragments and there are gaps between the bones despite attempts to restore a normal alignment. Mr. Naqui performs wrist fracture surgery at a number of hospitals around Manchester (See Hospitals page). The type of surgery performed is dependent on the fracture type and patient factors. Hence, the duration of surgery, length of hospital stay, type of anaesthetic used and type of surgical scar is unique for each patient. Mr. Naqui will discuss these aspects in more detail with you prior to surgery. Patients usually have a bulky dressing applied to the arm and wrist after surgery. Sometimes a small plaster cast may also be applied. They will attend clinic every few weeks for an examination and x-rays to monitor the healing process. The bones usually take 6 weeks to heal and so if a cast has been required, it is removed at 4-6 weeks. Any stitches used in the procedure, will be removed at 10-14 days after the operation at the clinic. Based on your fracture type and consideration of the degree of healing that has occurred Mr. Naqui will decide an appropriate time at which to remove any metalwork, if at all necessary.